Police across North Yorkshire have arrested eight people and carried out over 30 welfare visits to vulnerable people in connection with so-called “county lines” drug dealing over the past week. County lines is the term given to a type of drug dealing where criminals from urban areas such as West Yorkshire and Manchester, exploit young and vulnerable people, forcing them to travel to county towns such as Harrogate or York to sell drugs. It also involves a practice known as “cuckooing” which is where drug dealers use threats of violence to take over the homes of vulnerable people and use them as a base to store and sell drugs. North Yorkshire Police has been cracking down on county lines drug dealing. Police worked with housing providers and drug and alcohol workers, to provide additional support and advice for people who have been caught up in both crimes. Officers also visited pharmacies across Harrogate to raise awareness and help staff recognise signs that someone might be vulnerable or exploited. This could be anything out of the ordinary such as a person not collecting their methadone prescription for a few days, or unexplained injuries and officers worked with colleagues from British Transport Police to target people using the rail network to bring drugs into the county. Dete Chief Insp Graeme Wright of North Yorkshire Police, said: “This national week of action provided an opportunity to highlight and intensify the proactive work going on across the county every day. 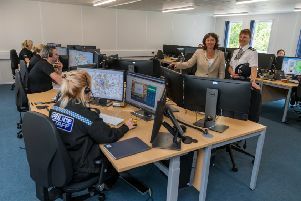 “The vulnerability aspect of county lines makes this an utmost priority for North Yorkshire Police to the extent that we have dedicated teams across the county whose sole focus is disrupting county lines activity and safeguarding vulnerable people. Since April 2018, the teams have made over 200 arrests. A man from Bradford has been charged and appeared in court after he was arrested together with another man on Woodfield Road in Harrogate on January 22. The 22-year-old was charged with possessing a class A drug, three counts of possessing class A drugs with intent to supply, dangerous driving and three counts of driving without insurance. He appeared at York Magistrates’ Court on January 23 and has been committed to Crown Court for trial. The second man, a 35-year-old from Harrogate was arrested on suspicion of being concerned in the supply of class A drugs and of breaching a previous court order. He has been sent to prison for the breach of court order, but remains under investigation for being concerned in the supply of class A drugs. On January 23, a 34-year-old man from Harrogate was arrested on James Street for breaching a court order for non-completion of unpaid work and on suspicions of possessing a knife. He has been charged with possessing a knife and will appear at Harrogate Magistrates’ Court on February 14. In Skipton two men were arrested after officers executed a warrant under the Misuse of Drugs Act on Craven Street on January 24. They include an 18-year-old man who was arrested on suspicion of possessing class A drugs with intent to supply. He has been released on bail while the investigation continues. The second man, a 28-year-old, was arrested on suspicion of being concerned in the supply of heroin. He has been released while under investigation. Officers also seized a number of mobile phones, a baton and 42 wraps of suspected cocaine and heroin from the premises. A 29-year-old woman was arrested in Harrogate after officers on patrol spotted a suspected drug purchase taking place between two men in a car and a woman pedestrian. As officers approached, the vehicle left the scene and was later found abandoned. The arrested woman was searched at the scene, however, no evidence of drugs were found on her and she was released. Enquiries are ongoing into the abandoned vehicle and its occupants. On January 25 a 34-year-old woman was arrested in Harrogate for failing to attend court on two drugs charges. She was remanded in custody to appear in court. On January 24, a 24-year-old man from Harrogate was jailed for 12 weeks for theft after officers stopped and searched him in a Harrogate car park on January 23. Although no drugs were discovered, stolen goods from a nearby store were.